The heavy-duty epicyclic knife drive gearbox provides an enhanced knife-drive system that increases drive capacity with less vibration and improved reliability. 89-mm (3.5-in.) knife stroke adds a more efficient cutting action. The increased stroke improves the cutterbar's ability to cut even in adverse conditions, such as large-stemmed crops or weeds, without plugging. Knife speed is 520 rpm. Reliability is improved with in-line versus wobble-geometry knife head, which oscillates in a straight line and not through a radius like the previous knife drive. Knife head and gearbox attachment are improved. Two cap screws can be easily removed if any service to the knife is required. The HydraFlex system hydraulically controls the float of the cutterbar by a simple turn of a knob in the cab. This provides exceptional cutterbar flexibility throughout the entire working pressure range. Higher ground speeds can be accomplished with HydraFlex, compared to the conventional float systems. Float arms, with hydraulic cylinders at every other channel, have replaced the mechanical linkage. These cylinders provide the cutterbar with the ability to float over uneven ground conditions with improved operator control. The platform HydraFlex system with an accumulator maintains a constant ground pressure over changing ground conditions. Manual mode is for locking out the cutterbar in the rigid mode. In automatic mode, the operator sets a desired cutterbar ground pressure, and the system will maintain this setting. If a different set point is desired, the operator adjusts the encoder on the armrest board, and an updated cutterbar float pressure reading will be shown on the cornerpost display. For increased ground following in uneven terrain, decrease cutterbar pressure to make the cutterbar heavy to the ground. If soil pushing occurs, increase the cutterbar pressure to make the cutterbar lighter to the ground. 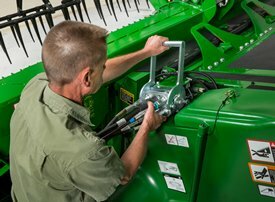 John Deere’s single-point header latching system provides combine operators a fast and easy method for connecting all front-end equipment. One easy motion of the lever connects the electrical and hydraulic circuits along with header retaining pins. Reduces the time required to change over headers, so there is more time available for harvesting. No tools required to remove headers for transport or storage. The enhanced single-point latching system, starting in model year 2016, will include a valve assembly mounted to all platform and corn head back sheets. These assemblies will include an orifice valve unique to the header type as well as a pressure override valve. Together, these ensure optimum performance and reliability of header hydraulic functions. Compatibility for prior headers or combines to model year 2016 equipment is provided by attachments specific to the header and combine being used.